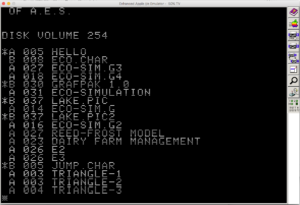 Apple2, AppleWin, Emulators, Programming, Random Thoughts, Virtual ][, by Michael. Yes, you read that correctly – AppleWin for the Mac. Well, not quite. It is the same current release of AppleWin for Windows users, what I’ve done is use WineBottler to package up the download into a self contained app that uses Wine to provide the Windows API support. If you don’t want to compile Wine yourself, there are pre-compiled Wine installers on the WineBottler download page. So, why would I want to do this on my MacPro? That’s a very good question. Most of the time I use Virtual ][ to emulate an Apple][, but when rebuilding my development environment to the MacPro I could find my license key, and as I was doing clean installs of my software that became a bit of a problem, so I’ve emailed and asked if it would be possible to retrieve my license keys (fingers crossed that comes through), but back to this story. One you’ve downloaded and installed Wine, WineBottler, and AppleWin, you start WineBottler and fill in the blanks and click the Install button and you’ll be prompted where you want to save the app bundle you’re about to create. In this one, I’ve selected “Self-contained” so that it bundles Wine in with the app. 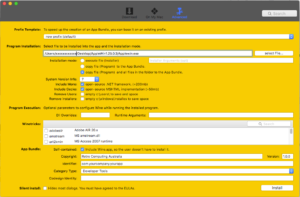 This will increase the size of the finished app, but will allow you to copy the app anywhere and it will run. If you’re happy enough to just run it on the same machine as your Wine install, than de-select this option, and the apps will be 200+ MB smaller. 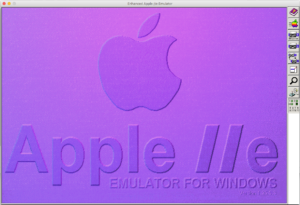 So you don’t have to go thorough all that you can either download AppleWin (including Wine libraries) or download AppleWin (without Wine libraries). Now that you’ve got the AppleWin.app where you want it, double click it and that wonderful purple splash screen will come up. 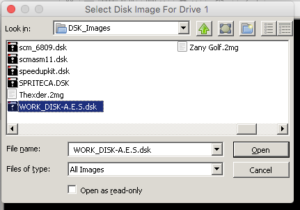 Click on the Disk-1 icon and the file dialogue will give you an amazing selection of one disk image, so select MASTER.DSK or we’ll be going nowhere fast. Well, at least we’re now booted, but it’s not going to get much more exciting, so we’d better go looking for some other disk images to boot. 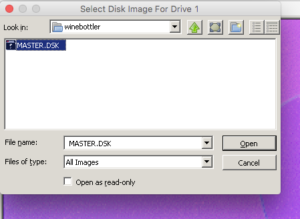 Fortunately we can select disk images outside of the Wine/Windows environment, so click on the Disk-1 icon again, but this we’ll navigate out of here, and in this example I’ve gone to a folder on my MacPro’s Desktop. I’m selecting the disk image that I recently (January 2017) made of a disk I found hiding in a storage box. This disk is one of my scratch disks from way, way back in the early eighties when I was writing programs for the School of Environmental Studies at the Nathan Campus of Griffith University. Yes, I know – I should have been studying. I’ll be doing a seperate blog about these programs, and making the disk images available so that you can p[lay with these wonderful little programs. 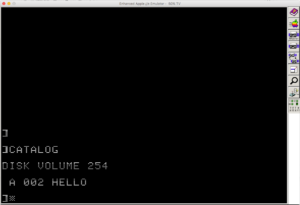 Now, click that Apple Icon to boot the emulator, and the “Hello” program displays a disk CATALOG (this is how we rolled back in the eighties). 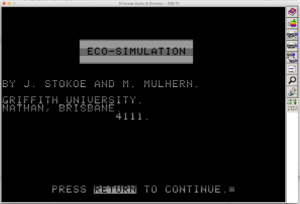 The program I’m after is ECO-SIMULATION, so I type “RUN ECO-SIMULATION” and what do you know, it works. I won’t bore you with the details, of the program (actually, I’ll save that for the next blog post) but here is the amazing graphical interface, and you’ll have to take my word for it – it has animations!!! 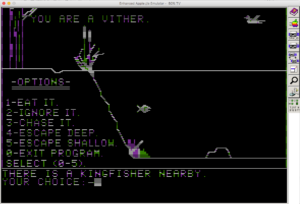 Spoiler alert, the fish is going to get eaten by the Kingfisher. Well, that’s how I’ve got AppleWin running on my MacPro, and yes, it is quite a good Apple][ emulator, and you can’t beat it on price ($free). . . . . and yes, I did get that email with my license keys, so I’ll get back to setting up my new development machine. this build should be part of the mail AppleWin repo !